The Opt+® Visa® Prepaid Debit Cards offer a safe, easy and convenient way to manage your money – for your busy lifestyles just like yours. Simply load money onto your card and use it to pay for online shopping, bill payments or everyday purchases. 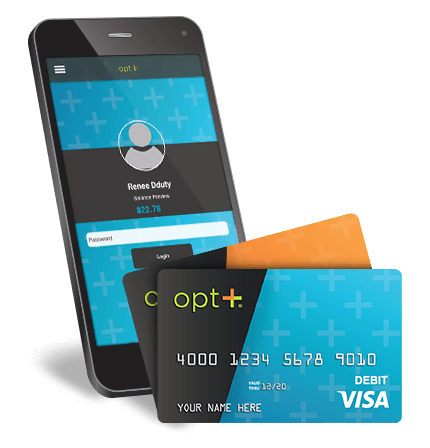 With the Opt+® Visa® card, you can manage your money here, there or anywhere! A card that can handle your everyday spending and your busy lifestyle. at work or on the go! Use your Opt+ card across the globe! Get your Opt+® Visa® Prepaid Debit today! Ready to give Opt+ a shot? Simply click the "Get Started" button below, provide some basic information, and you will be on your way to receiving your very own Opt+ Visa® prepaid debit card! Q: What are prepaid debit cards? Q: Where can I get a prepaid debit card? A: There are a lot of options out there. Opt+® offers three different types of reloadable debit cards. You can apply for an Opt+® Visa® Prepaid Debit Card online or get one at any participating Speedy Cash or Rapid Cash location. Q: How do I activate my Opt+® Visa® card? A: The activation process takes just a few short minutes, and as soon as your card has been activated you can immediately load money to your card and begin making purchases! Activate your card online at www.optpluscard.com or by calling 1-866-331-3063.